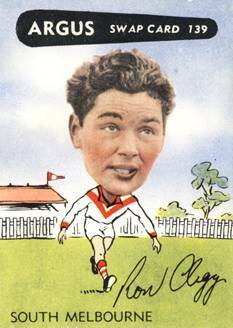 One of South Melbourne’s greatest-ever players, Clegg played 231 games and kicked 156 goals for the Swans from 1945-54 and 1956-60. 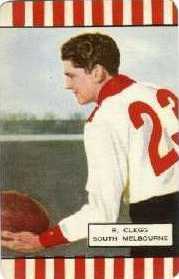 He played both ends of the ground, at centre-half-back and centre-half-forward. 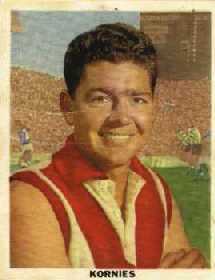 He won the 1949 Brownlow Medal and was runner-up to Bernie Smith in 1951. 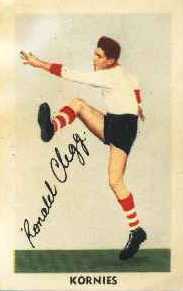 Clegg won the club’s best and fairest award three times - 1948, 1949, and 1951 - and was captain 1953-54 and 1956-60. 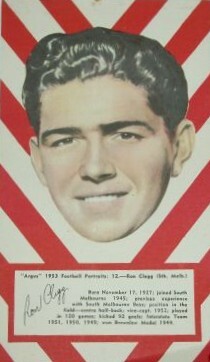 He captain-coached the Swans 1958-59. 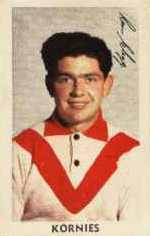 UNTIL the last four or five games of 1949 RON CLEGG was the permanent centre half-for- ward for South Melbourne. Then he was given the task of subduing rival centre half-forwards, and played even better in that position. 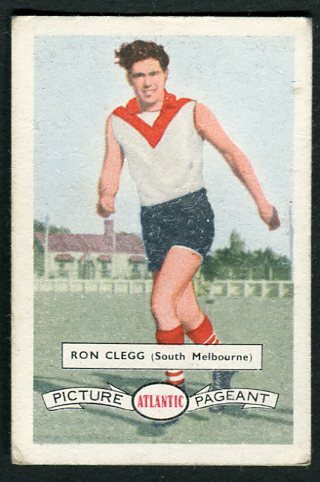 Ron opened this season as centre half- back, and it was confidently expected that he would hold down that job in the carnival games in Brisbane in July. 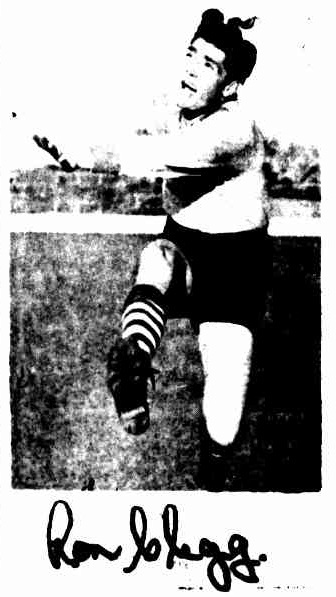 Unfortunately, Ron broke a bone in his wrist in that game, and will have to look on for many weeks. 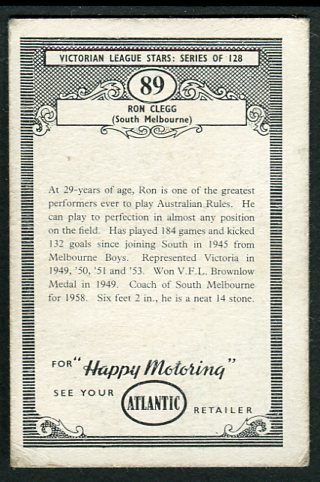 Ron, tall, fair, and with a cheery manner, was a very popular winner of the Brownlow Medal for best and fairest player in the League last sea- son. He himself says that the change to centre half-back in* those last few games just clinched the vote for him. He might be right, too, but he certainly played some grand games for South at centre half-forward. Ron is a beautifully balanced player, with high marking ability, long kicking, and great pace, anticipation, and judgment his greatest assets. 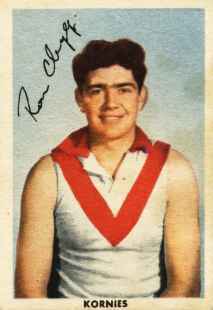 He was playing with the South Melbourne boys when his ability was dis- covered, and he had his first senior game in 1945, when he was 17 years. South Melbourne had some anxious moments when V.F.A. clubs sought the services of their star. 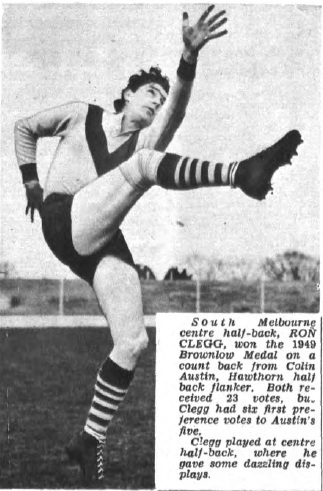 Most attractive offers were made to him before the 1949 season, but Ron was persuaded to remain with South. He is probably happy about Iris decision now, as, in addition to winning the Brownlow Medal, he won two separate awards for £100 each, plus several other amounts, and some handsome trophies. 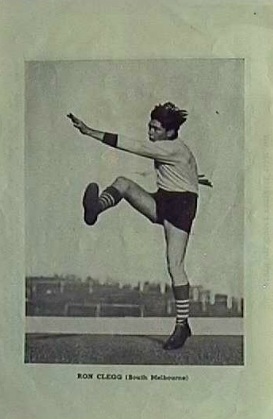 Football is Ron's first love, but lie has played for South Melbourne first eleven at cricket, too. Ron was married a few months ago, and is a traveller.